Even though Maine became a state in 1820, it was first settled along the coast during the early 1600s. And the Native Americans had been living in the area for centuries before that. Maine has a long and interesting past, which can be seen today in its many historical sites across the state. Here are the top 15. Fort Williams, most known for its lighthouse, is a former United States Army fort in Cape Elizabeth. It operated from 1872 to 1964 as part of the Coast Defenses of Portland and is now a public park. The fort contains three batteries where guns were once housed for war defense. Today you can see the ruins of the former batteries. The city of Portland was founded in 1633. One of the oldest parts of Portland is the Old Port. During the Revolutionary War, the city became a major shipping center. The city was destroyed by fire from a British raid in October 1775 and once again burned in the 1866 fire. The city had to rebuild again and much of the original architecture after the 1866 fire can be seen in the distract today. Acadia National Park is the oldest national park east of the Mississippi. This 47,000-acre part first opened in 1916. Much of the park was developed through funding from wealthy donors like George B. Dorr, Charles W. Eliot, and John D. Rockefeller Jr. Throughout the park and the island you can see the historic carriage trails and hiking paths and the mansions of the rich and famous. The Victoria Mansion was constructed between 1858 and 1860. The mansion served as a summer home for Ruggles Sylvester More, a Maine native who amassed wealth through luxury hotels in New Orleans. The inside of the mansion was extravagant, with high-end furniture and artwork. Now serving as a museum to the public, come take in the stunning sites of this immaculate home. Palace Playland is a seasonal amusement park located near the pier in Old Orchard Beach. While it may not seem like your typical historic site, Palace Playland first opened its gates in 1902. You won’t see any antique rides here, but you can enjoy the fun and laughter that has been here for over 100 years. Fort Knox was built in 1844 to protect the Penobscot River region from possible British attacks after the American Revolution and the War of 1812. The large stone fort was named after America’s first Secretary of War, Major General Henry Knox, who retired to Thomaston, Maine in 1796. The fort never saw military action and is in pristine condition for visitors during the warmer months. Henry Wadsworth-Longfellow, one of the best poets and writers in the United States, grew up in this small house on Congress Street. The house was built in 1785 by General Peleg Wadsworth where he and his wife raised 10 children. Henry’s youngest sister, Anne Longfellow Pierce, lived in the house up until her death in 1901 where she passed the house to the Maine Historical Society. All the household items and artifacts are original to the Wadsworth and Longfellow families. The Penobscot Marine Museum is Maine’s oldest maritime museum designed to preserve Maine’s rich maritime and shipbuilding history. The museum is only open during the summer months. Quoddy Head State Park is the easternmost point of the continental United States. 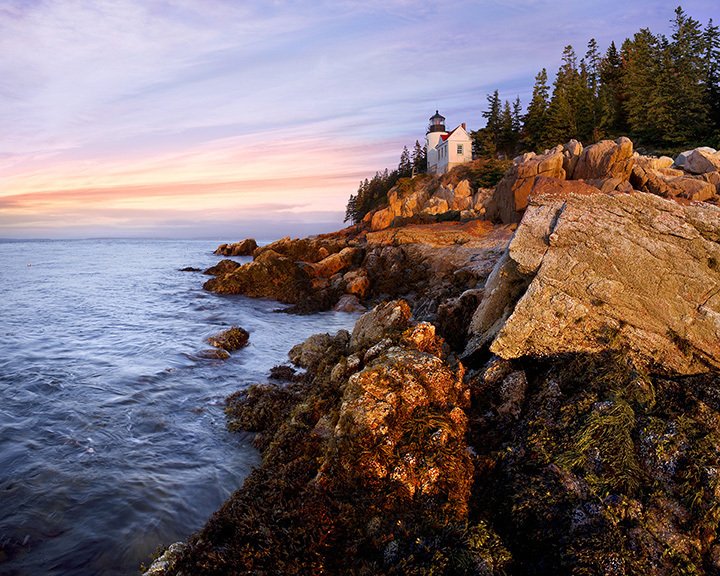 This 541-acre state park is home to the West Quoddy Head Light, which was built in 1808 to warn mariners of the dangerous cliffs and rocky ledges nearby. Quoddy Head State Park is the closest geographic point in the United States to Africa. The Baxter House is a small, historic home that now serves as a museum. Built in 1797, the house was the birthplace of former mayor of Portland, James Phinney Baxter. Percival, Baxter’s son, later became a two-term governer of the state and donated the land for Baxter State Park. Founded in 1939, the Seashore Trolley Museum is the biggest electric railway museum on the planet. The museum houses trolleys and streetcars from across major U.S. cities and even different countries. Tours take visitors through the grounds where these historic cars are stored, taking you to a different time. Owned by the Portland Museum of Art, the Winslow Homer Studio is located on Prouts Neck in Scarborough. Homer lived and painted many of his greatest masterpieces in this studio from 1884 until his death in 1910. Tours are available for the public from the spring through the fall. Established in 1783 in New Gloucester, the Sabbathday Lake Shaker Village is home to the only active Shaker Community in the world today. The village is situated on 1,800 acres and contains 17 historic buildings. There is a museum and workshop on site. The Fort Kent Blockhouse is located where the Fish and St. John Rovers meet in Fort Kent. The Fort Kent blockhouse is actually the only from the Artstook War of 1838, considered a “bloodless” war. The “war” was just a border quarrel between Great Britain and the U.S., but it was later resolved by the Webster-Ashburton Treaty of 1842. The small museum is now free and open to the public. View more Maine Historical Sites.